GGL Resources Corp. Reports Attractive Geophysical Anomalies at its Bishop and Rhombus Diamond Projects, Lac de Gras Region, Northwest Territories. | GGL Resources Corp.
Vancouver, BC - September 18, 2018 - GGL Resources Corp. (TSX-V: GGL) (“GGL”) (“the Company“) is pleased to announce that it has received final results and completed modeling and evaluations from ground geophysical programs conducted earlier this year near known diamondiferous kimberlites at its wholly owned Bishop and Rhombus properties in the Lac de Gras region, Northwest Territories. A combination of detailed ground magnetic, Ohm-Mapper electromagnetic (“EM”), and bathymetrically corrected gravity surveys were completed on the Bishop property, 40 kilometers southwest of the Diavik diamond mine. 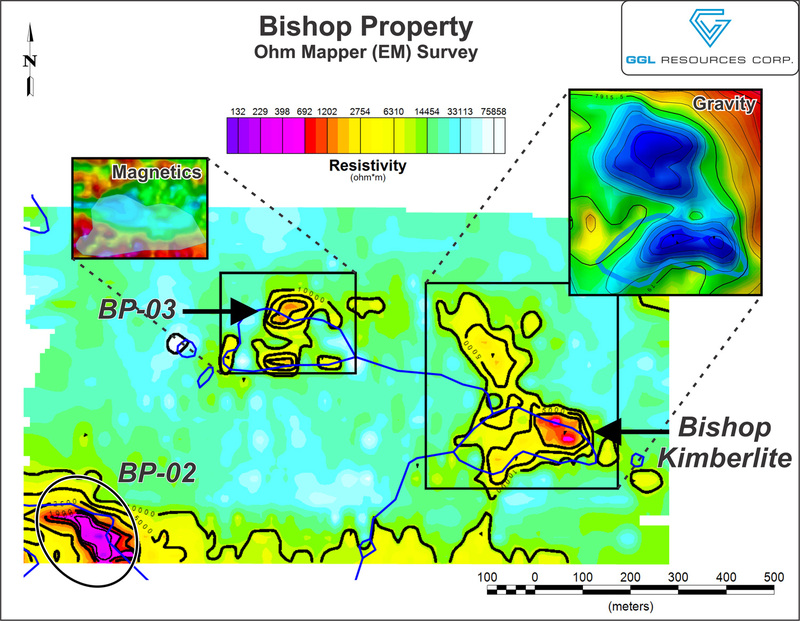 The majority of the survey work focused on previously generated airborne anomalies near the diamondiferous Bishop kimberlite discovered by GGL over a decade ago (see GGL news release dated June 12, 2006) and also covered the Courageous kimberlite located 12 km to the south. The Bishop kimberlite geophysical anomaly is described as a moderate gravity low with coincident resistivity low EM signature. Three new targets were generated nearby. See figures on company website. 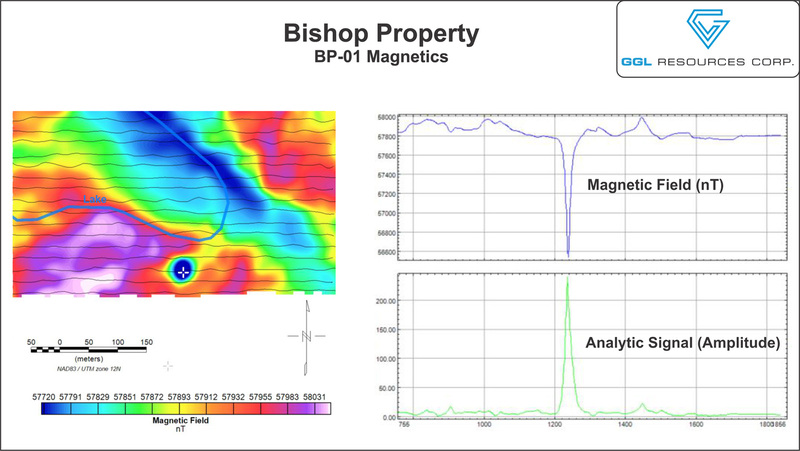 Target BP-01 lies approximately 1.2 kilometers northwest of the Bishop kimberlite and is described as a narrow 1,200 nanotesla, reversely polarized magnetic low located on land. Reversely polarized, intensely magnetic signatures are associated with many of the kimberlites in the Diavik and Ekati kimberlite fields at Lac de Gras and are representative of intrusive bodies that were emplaced during a period when the Earth’s magnetic poles were reversed. Target BP-02 is located 1.0 kilometer west-southwest of the Bishop kimberlite, in an embayment along a long linear lake. This target is a strong EM anomaly that persists to depth of investigation and measures approximately 150 meters by 100 meters. Three of the most productive kimberlites at the Diavik diamond mine exhibit strong EM signatures. 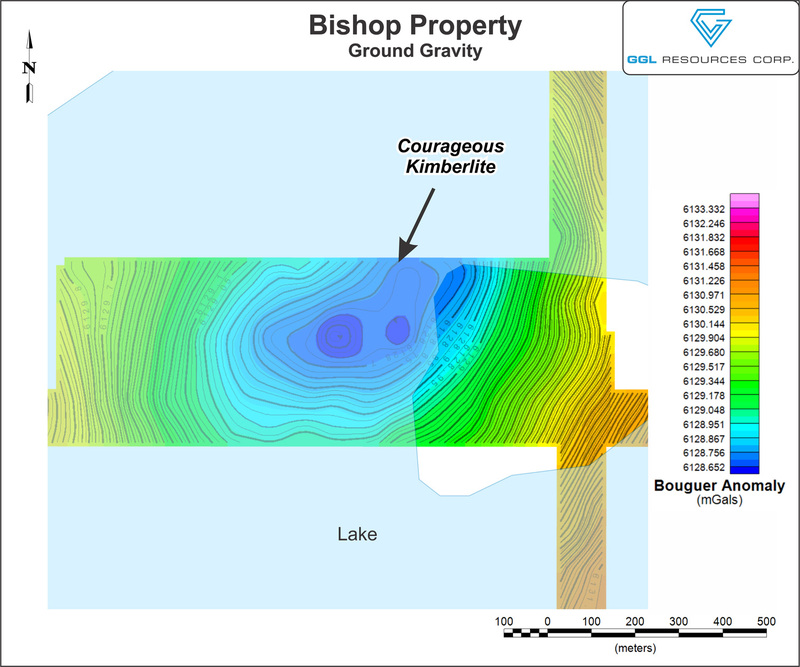 Target BP-03 is centered 650 meters west-northwest of the Bishop kimberlite, adjacent to a small lake. It is defined by an EM anomaly with an associated quiet magnetic signature within a lithologic package of noisy magnetics. This kimberlite target is interpreted to represent an intruding body locally displacing the host lithology. 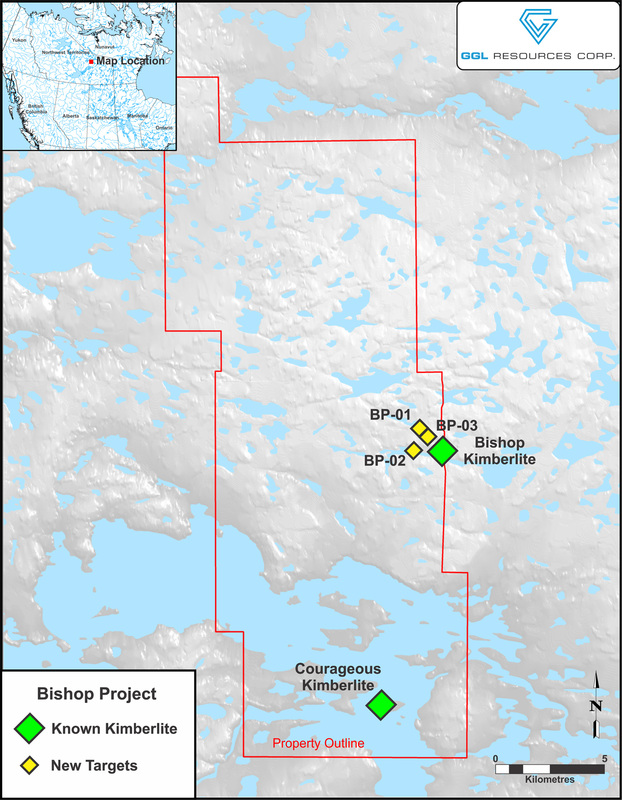 Two earlier drill campaigns focusing at the Bishop kimberlite have shown it to be a complex body with multiple intercepts across a 250 meter by 160 meter area. 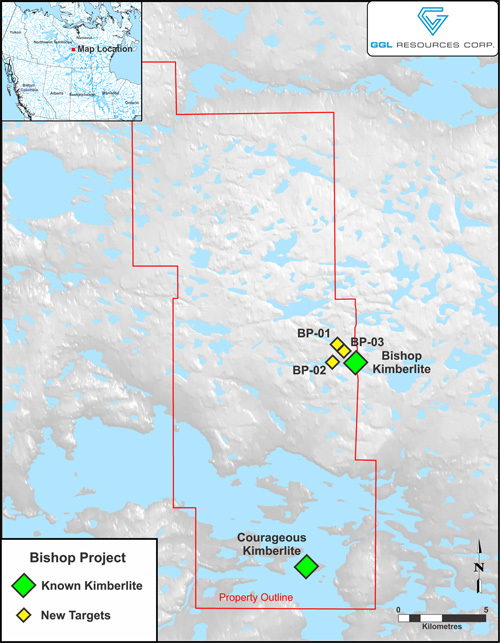 The recent geophysical program has identified new high priority targets with potential of adding additional kimberlite discoveries as stand-alone bodies or additional phases to the Bishop kimberlite complex. In the Lac de Gras District, all three of the above mentioned geophysical techniques have been used either independently or in conjunction with one another to locate diamondiferous kimberlites. Gravity and magnetic surveys were also conducted 12 kilometers to the south in the area of the historic Courageous kimberlite discovery. The Courageous kimberlite was originally discovered by previous explorers who announced a 78.4 kg sample containing 8 microdiamonds. Drilling difficulties prevented evaluation below crater sediments (see Consolidated Global Diamond Corp. news release dated May 19, 2008). 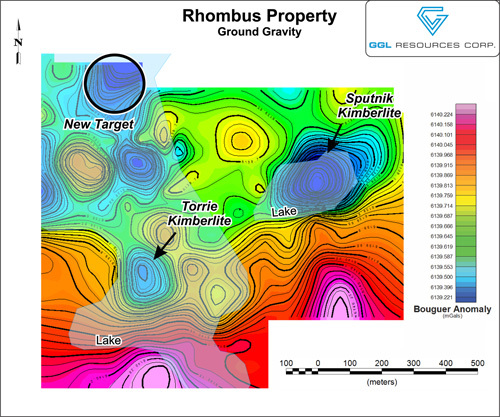 Public domain records of previous drill locations and survey work are limited but GGL believes it has delineated the Courageous kimberlite by its recent gravity survey. This survey returned an anomaly that measures 800 meters by 600 meters and is characterized by a 0.5 milligal (“mGal”) gravity low. No discernible magnetic features are present. 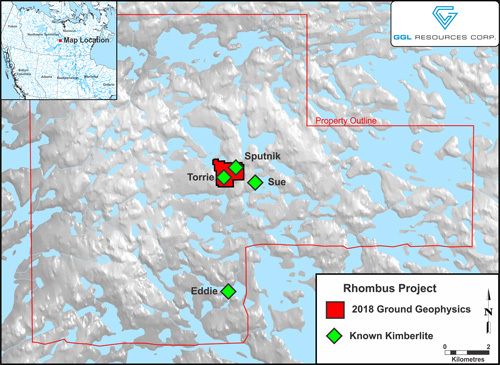 The Rhombus property, located 40 kilometers northwest of the Ekati diamond mine, received a full suite of ground geophysical surveys with an emphasis on gravity. The surveys were focused in and around the diamondiferous Torrie, Sue and Sputnik kimberlites discovered in the 1990s. Historically, gravity was not a widely used kimberlite exploration tool and GGL believes this years’ gravity program may be the first in this area. The Rhombus survey identified a 0.35 mGal gravity low target measuring over 150 meters in diameter located 600 meters north of the Torrie kimberlite in a moderate size lake. This gravity target has a quiet magnetic signature that lies between two magnetically active lithologies. The anomaly is open to the north requiring additional surveying to close it off. GGL is pleased to have identified these high priority targets in Canada’s most productive diamond district. The Company plans to follow up on additional promising geophysical and indicator mineral anomalies at other projects this fall to add to its inventory of drill ready targets. The technical information in this news release has been approved by David Kelsch, P.Geo, President of GGL Resources Corp., and a qualified person for the purposes of National Instrument 43-101. GGL is a Canadian-based junior exploration company focused on diamond exploration in Canada’s north with key projects in Nunavut as well as the Lac de Gras diamond district in the Northwest Territories. Lac de Gras is home to Canada’s first two diamond mines, the world class Diavik and Ekati mines discovered in the 1990’s. In addition to GGL’s key focus of diamond exploration, it holds diamond Royalties on mineral leases in close proximity to the Gahcho Kue diamond mine in the Northwest Territories. The Company also holds in portfolio several encouraging base metal and gold projects in British Columbia and Northwest Territories.